The infidel threw his shield in front of him, and laying his spear on his arm he ran swiftly at me, uttering a cry. I approached, having my spear at the thigh, but as I drew near I couched my spear and thrust at his shield, and although he struck at me with his spear in the flank and forearm, I was able to give him such mighty thrust that horse and man fell to the ground. But his spear hung in my armor and hindered me, and I had great difficulty in loosing it and alighting from my horse. By this time he also was dismounted. I had my sword in my hand; he likewise seized his sword, and we advanced and gave each other a mighty blow. The infidel had excellent armour, and though I struck him by the shield he received no injury. Nor did his blows injure me. We then gripped each other and wrestled so long that we fell to the ground side by side. But the infidel was a man of amazing strength. He tore himself from my grasp, and we both raised our bodies until we were kneeling side by side. I then thrust him from me with my left hand in order to be able to strike at him with my sword, and this I was able to do, for with the thrust his body was so far removed that I was able to cut at his face, and although the blow was not wholly successful, I wounded him so that he swayed and was half-blinded. I then struck him a direct blow in the face and hurled him to the ground, and falling upon him I thrust my sword through his throat, after which I rose to my feet, took his sword, and returned to my horse. The two beasts were standing side by side. They had been worked hard the whole day, and were quite quiet. When the infidels saw I had conquered they drew off their forces. But the Portuguese and Christians approached and cut off the infidel's head, and took his spear, and placed the head upon it, and removed his armour. It was a costly suit, made in the heathen fashion, very strong and richly ornamented. Any thoughts? Apparently the harness didn't completely protect the Moorish champion's face and neck, but defended his body from sword blows. Very interesting account, thank you for sharing it! Would this have been in Morocco? The possibilities are almost infinite, as at this time, north africans had acces to european, persian, egyptian, arabic and indian hardware by trade, and they could copy and/or combine each and any of it. I'd think that the most likely ones are the krug, the segmentata-like armour, charaine, or simply locally made and decorated european-like armour possibly with mail&plate parts. While the cited text is only a part of the whole story, it doesn't comment on the great unusuality of the harness, rather on that the portugese taking it, I'd bet it was a piece based on european armour. Mind you, this is pure speculation, nothing more. Yes, it happened by Ceuta around 1457. Note that von Ehingen doesn't seem to have had a shield in encounter; he at least never mentioned one, while he noted his opponent's shield repeatedly. The Moorish champion's armor doesn't come up in the text again. I'm surprised by how the opponent's spear stuck in von Ehingen's armor. As he was wearing a white harness, it must have partially penetrated into steel, though not enough to wound him. That is a very interesting excerpt. I am pretty ignorant on 15th century North African armour, but I do know that over the straits of Gibraltar in the Sultanate of Granada the Muslim Andalusians probably used European style armour such as brigandines, sallets and barbutas, although it was usually lighter and provided less coverage than that of their European counterparts. Muslim Andalusians also made use of a leather shield called the adarga (from the Arabic al-daraqah which simply meant "the shield"). North Africans were also quite conservative and relatively isolated from the Central islamic lands, so I doubt very much that Turkish/Mamluk/Iranian style mail-and-plate armours like the "krug" and "jawshan" would have been common. AFAIK (and my knowledge on this subject is virtually non-existant) no armour of this type has been found in North Africa. Another possibility you might like to consider is the use of multiple coats of mail. The most familiar example for this is El Cid wearing three coats of mail, the last of which stopped a spear or javelin that pierced the first two; but this practice was not restricted to Christian warriors, and seems to have been something quite common in both Andalusia and North Africa. I'm not sure about whether the practice lasted into the 15th century, however. One of the possible interpretations for the use of the term of " double maille " ? ( Never defined in a clear unambiguous way in period texts as being layered maille or just heavier/denser types of maille, as far as I know ). Just theoretically, I could see wearing a very light but close weave/small ring shirt over a linen or wool shirt, a gambison over this light maille and a hauberk of larger heavier rings over the rest: This shouldn't be to much heavier that using just one maille shirt and make it much more difficult for arrows or other pointy thing to get through all the layers: Anything piercing the first layer of maille would be dulled, if sharp, and would have to then pierce or cut though the gambison and finally have a tight weave maille to pierce having lost a lot of it's initial energy with the gambison material all bunched up around the projectile or weapon tip ! Oh, and a bit like wearing layers in cold weather the option to armour up or armour down depending on threat level could be useful. Didnt the roman lorica hamata have a double layer at the shoulders? Would double maile instead of two seperate coats be a 1in8 pattern instead of 1in4? Maybe. Another possible interpretation is the one in this page: http://www.geocities.com/normlaw/page2.html --a heavy 6-in-1 weave. Lafayette's link looks very much like the mail on period effigys,but this makes sense because it is double, as one row has double the links of a normal row, but would it not also look like this with flat links? Quite possible that the weave was the way double maille was defined but possibly the term " double maille " may have been used for various types of ways of making maille " doubly effective ". So, informally someone wearing two layers of maille could be said to be wearing double maille and at the same time and place someone using extra strong maille by weave style or thickness of wire could also be said to be wearing double heavy maille ? But I guess it's just a lot of guesses unless someone finds some period documentation that actually defines the term in great technical detail. In some ways we could forget about the term double maille and just look for instances of maille being used in layers ? With a coif the mantle part does overlap the hauberk so one does encounter double layers of maille in certain areas very often. The use of a full shirt of maille in multiple layers would be somewhat a different thing in intent rather than incidental layering ? interesting. I was pretty bad at German in high school but I can just about determine that this is probably Mittelhochdeutsch and not your average German. I'll give it a shot with a dictionary. dan ich war gar wol gerüst und gantz geregnig inn ring harnisch. I was well armed and very geregnig in my ring armor. geregnig could mean something like active or lively but if you read ring harnisch as mail it could very well mean flexible or agile. ring could indeed indicate mail armor but that is not the only possible translation. As we know ringen is wrestling and could be seen to mean fight or fighter so in that regard it could also indicate he was wearing war armor. The site gives some more translations for Ringe as adjective etc. and in all these it means light, unburdened, careless, carefree and comfortable. So the sentence could also be read as: " I was well armed and could move actively in my comfortable armor" or something similar to that. I had my lance at my leg/thigh, and when I came close to him I threw it in my lance rest. Again gerüst can be open to more interpretations but in this case I think lance rest is the most adequate. In summary: either he was in mail armor and possible had a lance rest or he did wear plate armor. The text doesn't rule out on conclusively, however seeing the date I am inclined to go with plate armor. Could you provide me the link / book of the Jorg von Ehingen' adventures? I've been looking for them but did not get to find it. About the armour, as far as I know the north-african cavalry wouldn't wore armour at all (except for a helmet, maybe). But the elite soldiers of Muslim Andalusia wore heavy armor, for sure: smuggled from Christian kingdoms or produced in their own major centers at that time. Nevertheless less heavier than their christian counterparts. I don't have many references on the subject besides a certain Osprey's book which I didn't even own. But as I said, the cavalrymen of northern Africa wore no significant armor. But as he was a champion, then he probably wore a jazerant, an armour that North African's muslins were particularly known by their eastern counterparts. I doubt that was any kind of western alike harness (based on what the german knight wrote). Did the ottomans and the persians had krugs and plated mails at that time? Thanks for the post, I quite enjoyed the bit about Moroccan gunpowder usage. Cloth covered armour is common in many cultures, and can mislead people into thinking none was worn. Mail between two layers of cloth was a common form of Arab armour. 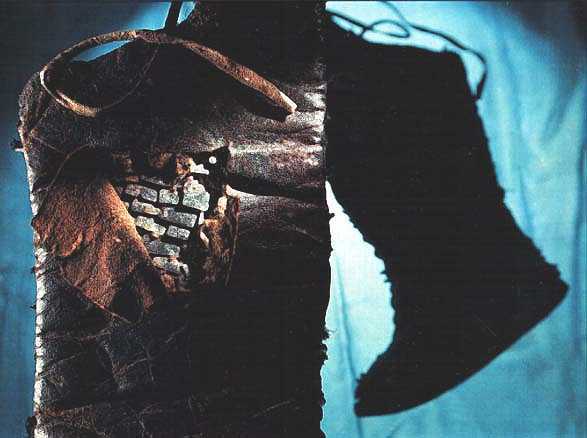 My favorite example is the Khazar boots that have iron scales hidden in them. I just read the second text. "Allso batt ich den kapitany, daß er mir söllicheß zuo thon vergünden wöllt, dan ich war gar wol gerüst und gantz geregnig inn ring harnisch. So hette ich och ain starcken, werlichen jennetten, der mir vom küng geschenkgt ward." - So I asked the captain that he may allow me to do such (fight the moor), because I was very well armed (gar in this case is meant as an heightening) and completely encased in ring armour. ("gantz" = completely, "geregnig" = is quite hard to translate because it is no more used in modern german, but together with the gantz it is clear that he is "completely covered" or "completely encased"). So I had a strong, well-fortified ("werlichen" word by word means well-fortified, in modern german "wehrhaft" means something like "he can fight back, or defend himself") genet which was presented to me by the king. (a genet is a horse you get when you mix a barb horse and a spanish horse, these were known to be the best horses for warfare. The barb horses were second best as these were to small, while the spanish horses were bigger). It is interesting to see that he points out which horses they rode, a genet as well as a barb. The richly ornamented can either be found in a different version of the text or was later added by the English translator. Peter, do you know were I can get Ehingen's biography? @Pedro, sadly not. I'd like to have it myself. Do you know the full name of the knight? It probably is digitalized somewhere. But unless I know the full name I can't do anything. There were quite a lot members of the family "von Ehingen".